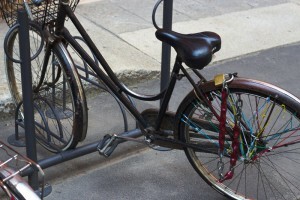 Rather than locking up the bike so that the chain can be removed with a single movement it is better not to lock it up at all: you save the effort and the result is identical. 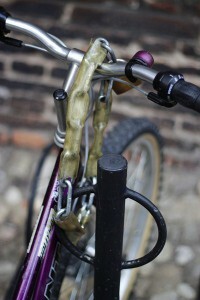 Chain simply resting on the handlebars; only one movement is needed to remove it. 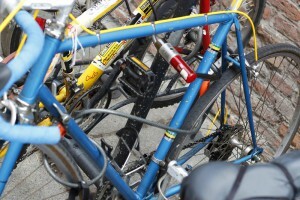 The chain (or cable) must always pass inside a closed triangle of the frame; the one supporting the rear wheel or the central one. A chain with such a small cross section that it can be cut with an equally small cutter. 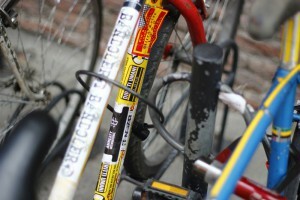 This is only just slightly stronger. 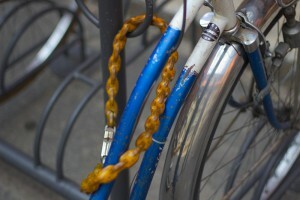 The steel cables must have a cross section of at least 8 mm and the chains must not be less than 5 mm (it also depends on the materials used and, in the case of chains, the shape of the link cross section) so that they can only be cut with medium/large cutters which are difficult to carry around and use without arousing suspicion. 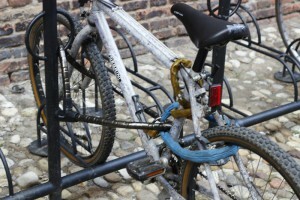 Only the rear wheel is locked up: the bike can be taken away without any problems. 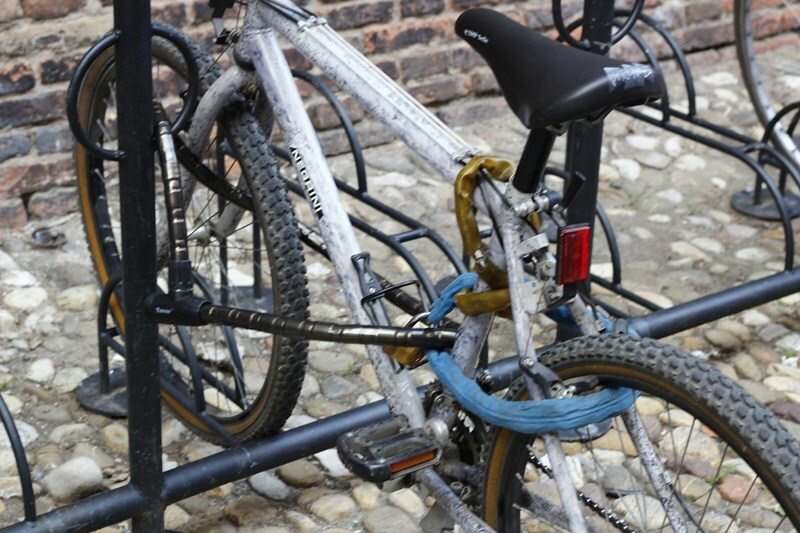 The only thing a thief needs is a bit of cheek to take the bike and carry it away by hand, as if it were his and he had just forgotten the keys at home… This is why the bike must be secured to a fixed point whenever possible. 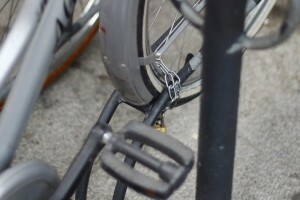 If only the wheel is locked up the rest of the bike can be stolen by unscrewing 2 screws. Yes, the thief will find himself with a bike without a wheel, but he can always obtain one easily from a bike locked up with the following error. 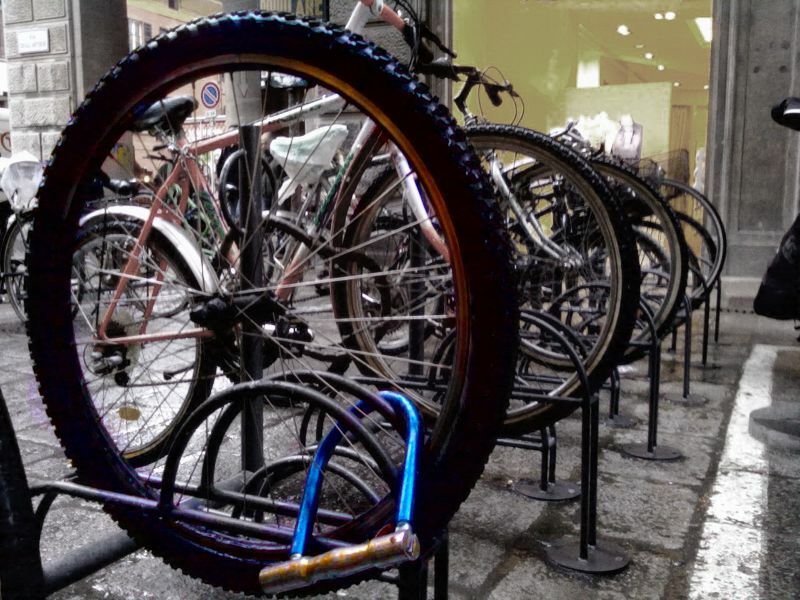 If only the frame is attached to a fixed point, the wheels can be removed by unscrewing 2 screws. An example of how to lock up a bike well: a chain locks the front wheel and the frame to a fixed point, whilst a second chain locks the rear wheel to the frame. 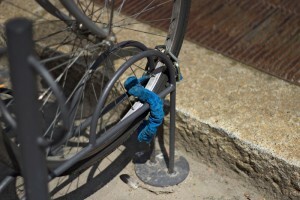 Anything which can be cut with a cutter, such as chains, cables and padlocks, must never touch the ground. 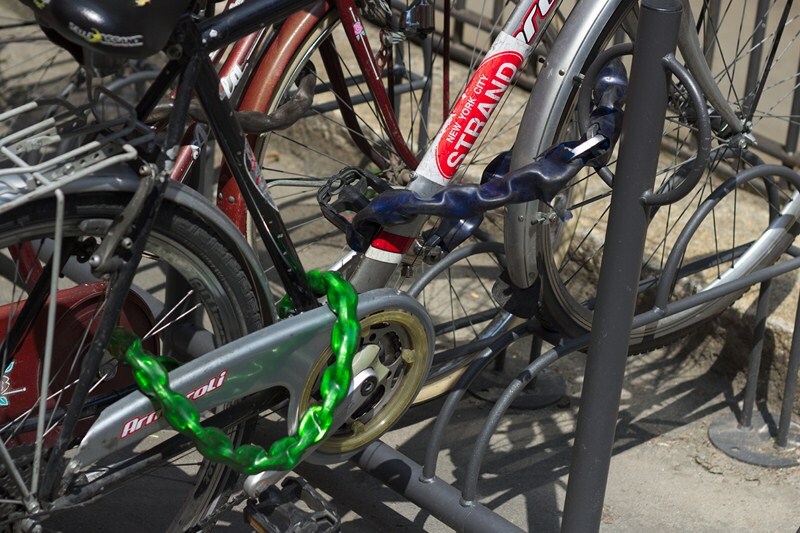 A chain or a padlock which touches the ground can be cut much more easily. A chain or a padlock which touches the ground can be cut more easily. 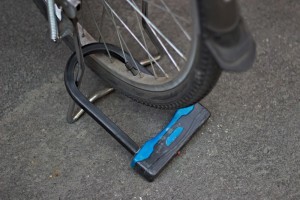 In this case, in fact, it becomes much easier to cut it with a cutter by resting one arm on the ground and loading all one’s weight on the other arm. If, on the other hand, the item is raised, it is necessary to squeeze the cutter with both hands, and, without the lever effect on the ground, the force that it is then possible to exert is much lower. To finish, let’s look at some examples of bikes which have been locked up in an excellent way. 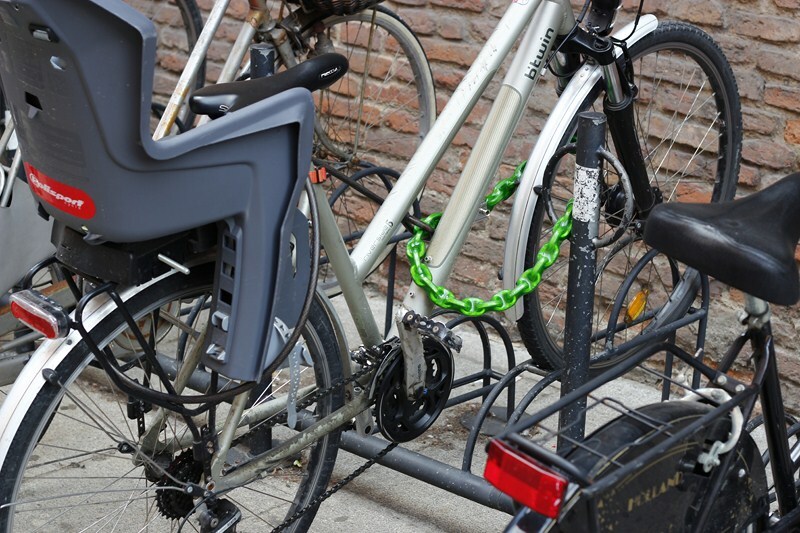 No anti-theft device is 100% safe, but we can be certain that between a bike locked up properly and one locked up badly a thief will always chooses the latter. 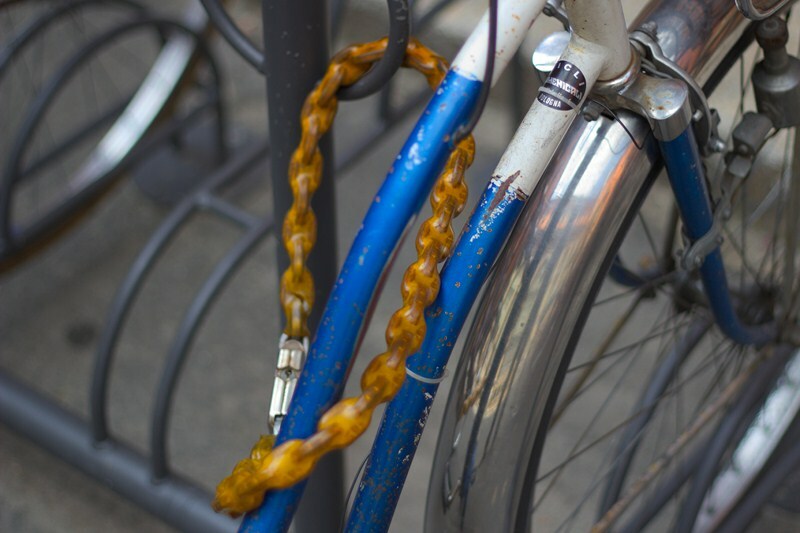 A chain with a padlock locks together the front wheel and the frame to a fixed point and a large steel cable locks the rear wheel. In this case, the wheel and the frame are locked to a fixed point with an armoured cable. A chain then secures the rear wheel. The frame is anchored to a fixed point with a U-lock, which also secures the 2 wheels using a large cable. 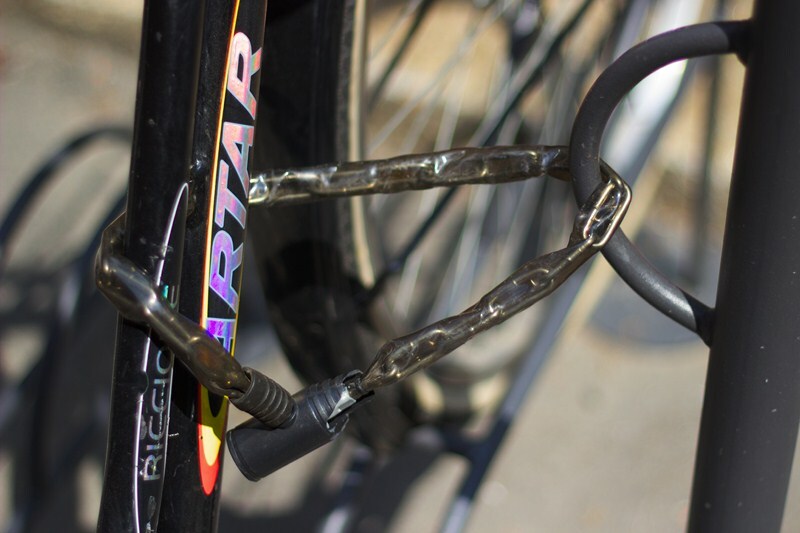 This is a very simple but effective way to lock up the bike: a chain with a good quality padlock locks the frame and front wheel (the easier one to steal) to a fixed point. Locking up a bike in this manner does not require any more time than locking it up badly, but is much more secure!